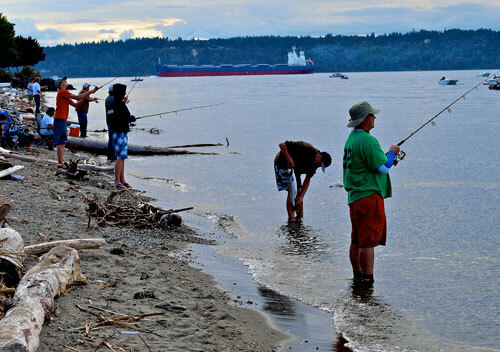 Photo of Salmon anglers at Three Tree Point. Three Tree point in a well known local hotspot for mooching for Salmon. The Kings and Coho run hot and heavy here and your likely to bump into a couple Pinks or Chum while pitching pink buzzbombs. Around August it does tend to get crowded with fishermen when the salmon are running, so as for our combat fishing rating, eye protection is highly recommended!